Look at all those knobs. Just look at them. The Eventide H9 is a magical effects box for musicians, and it is especially relevant to iOS users because it can be completely controlled by an iOS app via Bluetooth, putting virtual knobs and dials on the screen of an iPad or iPhone. Today, we’ll review the EvenMidi, which is a box that does one thing — adds bunch of knobs the the Eventide H9 so you never need to touch a screen again. The Eventide H9 is designed to be controlled with an app. Knobs and screens are both great interfaces, and both are better at some things than others. The Eventide H9 is a guitar effects pedal that has tens different effects algorithms inside it, and up to 99 presets. All of these are controlled by a few buttons, and one big knob. 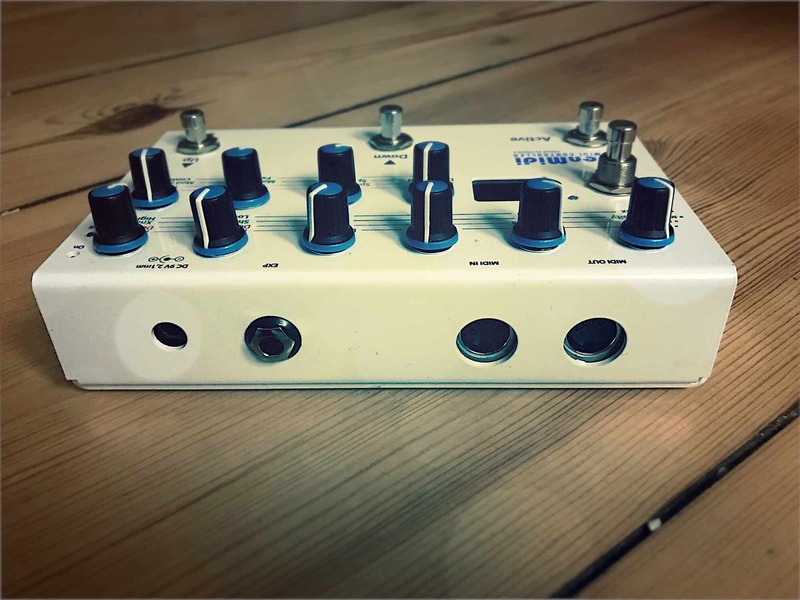 The H9 is actually a combination of four more orthodox Eventide pedals, all of which have real knobs to control each effects parameter. The H9 is so well designed that it is actually easy and quick to make adjustments on the pedal itself, but it really shines when used with the companion app, which runs on iOS, PC, Mac (and soon, on Android). This hooks up via Bluetooth, and offers quicker access to all controls. Take a look. Here’s the H9 app’s interface, alongside one of the physical pedal that it mimics. The iOS app mimics the physical pedals it’s based on. On the right is the H9 Control app. On the left is Eventide’s Time Factor pedal. Which one do you think is easier to tweak as you play guitar on stage? The EvenMidi that we’re reviewing today adds these knobs back to the H9. 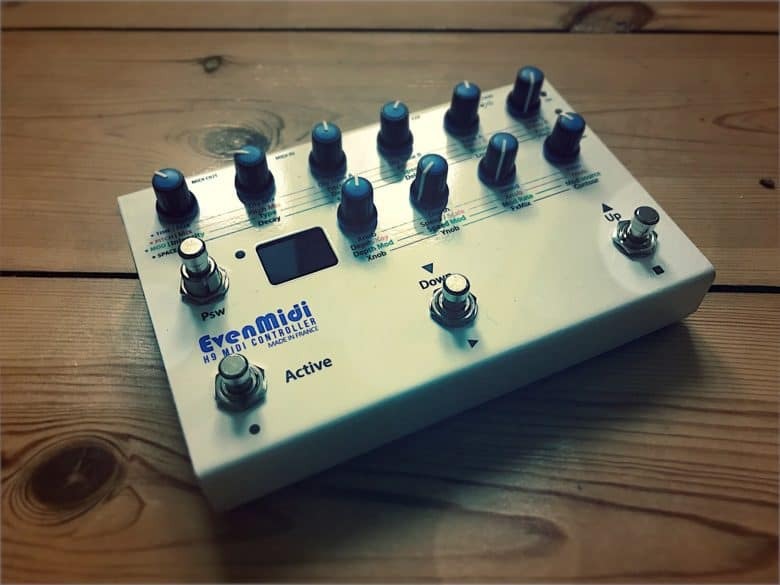 The EvenMidi pedal comes from a small French company, and is meant to be used in conjunction with the H9. It connects via MIDI (a standard way to hook music devices up to each other), and then the knobs on the EvenMidi control the settings on the H9. The EvenMidi does no sound processing itself. It’s just a controller. And a good one at that. Initial setup is easy. I got a little confused by the instruction manual, but it turned out that I was changing settings that had already been preset. The EvenMidi can control any MIDI device or app, but is pre-configured to work with the H9. The setup is simple then, involving a few minutes of changing setting on the H9 itself. If you’re at the stage where you are buying a €200 box to control a fancy effects pedal, you’re more than capable of getting things set up in a couple of minutes. The EvenMidi controller has a real knob for every virtual knob on the H9. Turn the knob, and the setting changes on the H9 pedal. There are also three foot switches that allow you to switch between presets, and to toggle the connected H9 on and off. A fourth foot switch is assigned to be a “performance switch.” It’s function varies depending on the effect you’re using, but it can shift the pitch of the effect, or freeze the note you just played so it goes on forever, and much more. The box is solidly built. The knobs feel good, and the foot switches are the soft-touch kind that doesn’t click and click and click. The unit feels like it will last. The pedal also has some extra ports. It can control up to four pedals simultaneously, and you can also connect an expression pedal, a treadle that allows you to control parameters with your feet. The EvenMidi is great, although there’s one limit that makes it a little harder to get used to. I’ll get to that in a moment. While the iOS app works really well, you’re still using a computer, and that can take you out of your creative flow. For creating and managing presets, or for getting deep into some sound design, the app wins easily. But for tweaking sounds on the fly, the EvenMidi is way, way better. For example, the H9 has a looper algorithm that lets you record what you’re playing, and then loop it over and over. This can be used to make a simple backing track for you to play a melody on top of, but thanks to many tweak-able parameters, you can turn knobs to slow down, chop up, and otherwise mangle sounds. I lost a good hour sat next to the EvenMidi with my guitar, twisting knobs to build some amazing sounds. I even recorded some nice ideas for songs, which wasn’t bad for an initial test run. Another example would be delay, the ECHO, Echo, echo effect. the H9 has a lot of different delays, but all of them are better when controlled with knobs. For instance, if you play a chord, and then tweak the delay-time knob while it is still repeating, the pitch will change. That’s possible with the app, too, but grabbing a knob is more immediate, and encourages experimentation. The EvenMidi suffers from two problems, both of which can be blamed on the host H9 itself. One is that the knobs often don’t reflect the state of the parameter they are controlling. For instance, when you load a new preset or algorithm, the new software settings change, but the positions of the physical knobs doesn’t. The EvenMidi plays catchup. As soon as you move a knob, the software leaps to match it. This can cause some issues as parameter settings make big jumps to catch up with the position of the knob, but in practice it’s not too bad because a) in the home or the studio, any sudden jumps don’t matter and b) on stage, you’ll already be intimately familiar with the settings, thanks to practice. The bigger problem is that sometimes you don’t know what a knob adjusts. The EvenMidi’s metal case has the generic functions of the four main groups of effects printed next to the knobs, but they vary within those groups. Sometimes, the display on the H9 tells you what you’re adjusting, but usually you just see letters or numbers changing. This means that you have to put in some time learning what the knobs do for your favorite algorithm. This can mean working with the iPad running the H9 control app, as a reference, or just printing the relevant screen from the app as a quick guide. Like any other pedal, though, you soon get used to where the knobs are, and stop having to think about it. If you have an H9 and you want to add knobs, then you’ll love the EvenMidi. It’s well built, it looks great, the design has been really well thought out, and it Just Works. My H9 had been reduced to serving up a few presets that I’d already saved, but the EvenMidi has opened it up again. The H9 really is an amazing little box, and the EvenMidi helps it achieve its full potential. Recommended.